bajalocom is a typical liberal Democrat YouTuber. 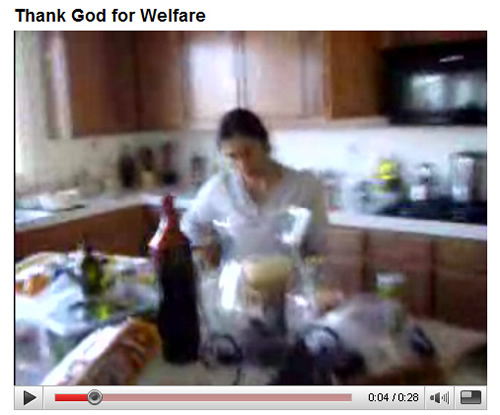 If you don't believe me just click on the screenshot below and watch his video where he brags about being on welfare. Since the screen shot was taken he has renamed the video, but left it online. Apparently he did not thinkit was so cute after people asked him why he would brag about welfare. Of course, he hated the Bush administration and he hates Republicans, but loves Barack Obama. I wonder who he thinks pays for that welfare he is so proud of being on? He's rabidly pro-immigration, and is very quick to bash any Republican effort at securing the border, or anything else for that matter. bajalocom represents the modern liberal Democrat, he bashes everything about America while simultaneously being a parasite on American society. And he's proud of himself. Listen to his many, many videos regarding his liberal opinions if you don't believe me.